Hey! I know that YA section!! :) Great pic! Hopping through. Oooh...surrounded by books. Now isn't that a dream come true? Before reading the caption I thought that was your bookshelves! I was like damn! You have a lot of books! Wish I had room for that many shelves! Hi there! New follower. Love the photo - look at all those lovely books! I love being in bookstores - but my boyfriend hates taking me to them. I can keep myself busy there looking at all the books for at least an hour each time! Great picture, surrounded by books, happy Friday! Happy follow Friday! I am a follower. SOOO MANY BOOKS!!!! Haha I thought that was all yours for a second and was really amazed! But I wish my home could look like a bookstore :) Great picture! 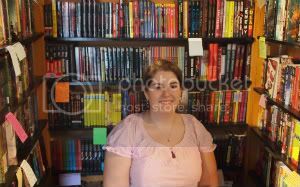 Look at being surrounded by all those lovely YA books. I would be in heaven. Great picture.